The Kush tour has spanned 1200 miles across the west coast. 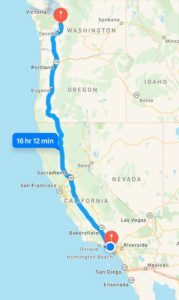 We started our long drive from Seattle on October 29th, and today we make our final stretch south to Cathedral City. Along the way, we’ve had the opportunity to meet with many of the users on our platform and get an inside look at the first legal harvest in California. Our time in Northern California was spent touring farms within the emerald triangle. For most people out there in the mountains, farming cannabis is a way of life that they have known for generations. This is where some of the best outdoor bud in the world comes from and there is quite a lot coming down. We must have seen three to four tons of cannabis bud and trim during our short visit. been for thc-yielding trim and biomass. Massive labs are struggling to source enough processing material to keep their machines running. We followed a small lot of some bud from Humboldt all the way down to Bel-Air where it was processed into pre-rolls. It’s quite rewarding to see the full process. Next up we’re headed to Vegas! We’ll be at MJ biz-con meeting up with the rest of the Kush team so please, stop by and say hello! We’ll be at booth 1252 and we would love to see you there. If you can’t find the booth just call us at 206-587-KUSH and we’d be happy to help. Our Co-Founder Chase was featured on This Week in Startups this week! Click the link below to hear about the origins of Kush and the ever-changing cannabis industry.